Millions of people around the world are searching for their soulmate and hoping to find that one person that will make them feel whole. Are you one of them? And have you tried many things to no avail? Does internet dating, clubbing, speed dating, bar hopping, and being set up by your friends always end with the same loneliness at the end of the night? You are not alone. In the modern world, there are many ways for people to find love. But finding love isn’t just about where to go or meet up with people. Sometimes people may have limiting mindsets or beliefs that keep them from connecting with that one special person that they may share their lives with. 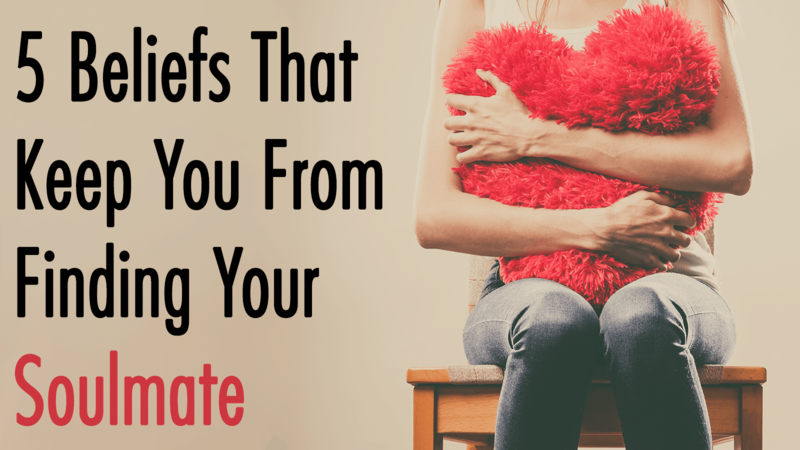 Let’s explore five common limiting beliefs that prevent people from finding their soulmates. Many people feel that everyone “good” out there has already been taken and that there’s no one left for them to love. And when you feel like there is no one “good” available anymore then you start to judge everyone you meet as “bad”. How can you let yourself open up to love if everyone you come across is immediately judged as bad? This mindset can easily happen to people who have had their heart broken in the past. After your trust has been betrayed, it is important to not become jaded and let it ruin your future. While there actually are plenty of bad people out there that can hurt you, don’t forget that there are just as many if not more good people that are worth loving and sharing your life with. When you start to overcome the bad experiences that have left you scarred, then it will be easier to move forward in the quest of finding your soulmate. This is a common limiting belief that both sexes frequently struggle with. It also frequently leads to people getting into bad relationships and starting unhealthy patterns. The bottom line? When you meet and start to date someone, ask yourself if you could live with them the exact way they are without them changing a single thing about themselves. If the answer is no, then you need to consider that this person is probably not the one you’re meant to be with. Most of the time, you just can’t change who somebody is no matter how much you love them. If people want to change anything about their lives and who they are, then that is a decision they usually need to make for themselves. And if you find yourself wanting to change everything about your partner, then they are probably not your soulmate. When it comes to finding your soulmate, you may be inclined to settle for someone that pleases your parents instead of pleasing yourself. Unfortunately, a lot of people make this mistake and ultimately end up marrying someone that they never truley loved but whom their parents adored. And maybe it isn’t your parents you are looking to please. Maybe you are trying to find someone that your church or religion approves of. Maybe you’re trying to find someone that fits in with your group of friends. But how can this person be your soulmate if you aren’t the one choosing them? It is important for you to date based off of your own preferences and not the preferences of your loved ones. This belief has caused many people to marry someone completely wrong for them just so they wouldn’t be single by a certain age. But you can’t rush love. Contrary to the messages that we receive from the world around us, it’s okay to be single. And there are plenty of happy singles who are well into their 30’s, 40’s, 50’s, and older. If you find your soulmate and are happy with them at a young age, then that is perfect. But don’t jump into spending the rest of your life with the wrong person just so you don’t have to be alone. It is worth it to develop the belief that it’s better to be single by the time you reach whatever age than it is to be trapped with someone who is totally wrong for you. Some things are red flags for a reason. Maybe you absolutely can’t be with someone who smokes or maybe you are allergic to cats and can’t be with someone who has them. Could the red flags you’re ignoring even point to signs of abuse? This belief causes people to get stuck in bad relationships over and over again. Why get yourself stuck in something bad if you have an inkling that this person isn’t right for you? Don’t ignore red flags when they come alone. And foster the belief that you are worth being with someone without major red flags. Whatever limiting belief is holding you back, it is okay to admit you have a problem and find a way to try and move on. After all, finding love is a beautiful thing so why hold yourself back?